YOUR GREATEST JOURNEY IS WITHIN. 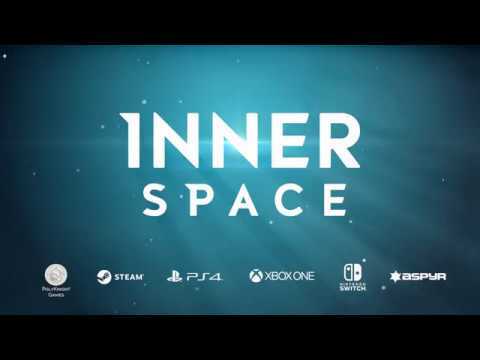 © 2018 Published and distributed by Aspyr Media, Inc. “Aspyr” and the Aspyr “star” logo are federally registered trademarks of Aspyr Media, Inc. InnerSpace developed by PolyKnight Games, LLC, published by Aspyr. Aspyr is a registered trademark of Aspyr Media, Inc., and the Aspyr star logo is a trademark of Aspyr Media. InnerSpace is property of PolyKnight Games. All other marks and logos are property of their respective owners. All rights reserved.No part of the game may be used for any purpose other than indicated in the End User License Agreement. Therefore, reproduction, modification, storage in a retrieval system or retransmission, in any form or by any means, electronic, mechanical or otherwise, for any purpose other than indicated in the End User License Agreement, is strictly prohibited without prior written permission.